Good evening, fantasy football fans. Tonight we have the third installment in a series of guest posts from Cris at Fantasyomatic.com. To catch up on what he's doing here with the series, scope out the first paragraph - otherwise, skip to the meat of the guest post to find out which team TEs are ranked in the top 3 Fantasy Points Against Strength. Welcome to part three in a series of draft prep articles leading up to training camp (read part one - WR here and part two - QB here). This week the focus is on fantasy TEs. We ranked all 32 teams based on their Fantasy Points Against Strength with a breakdown on each team and profile of each TE candidate. You will also find helpful information on 2009 Yards Per Attempt, 2010 Strength of Schedule and 2010 Fantasy Playoff schedules. 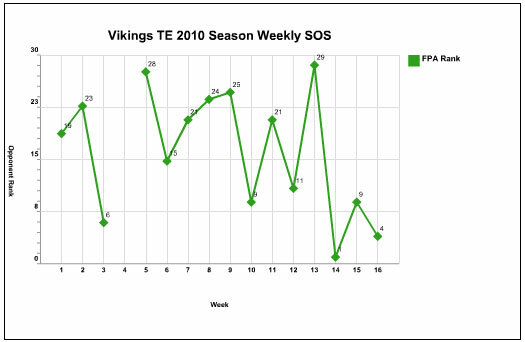 Don't worry about Fantasy Points Against (FPA) data here being grabbed just from 2009; the algorithm used here at Fantasyomatic.com has been hard at work cranking out "defensive ranking against fantasy position" projections all spring. The FPA values you see here include 2010 adjustments for the draft additions, free agency additions, coaching changes in the offseason, defensive scheme updates, daily fantasy news updates and up to the day depth charts. In addition, the FPA values are also weighted against their strength of opponents in 2009 and then again against their strength of opponents in 2010. For rankings beyond 1-3, see the full article here on Fantasyomatic.com. The Redskins threw the 13th most yards to TEs in 2009, but now Mike and Kyle Shanahan are in town and they brought in a QB in Donovan McNabb who has made his living throwing to TEs. Last year McNabb threw 969 passing yards and 8 TDs to TEs, and WAS threw 850 yards and 11 TDs. Washington had the league's second highest TE RZS% (46% of all their Red Zone TDs went to TEs). Kyle Shanahan drew up enough plays to TEs in Houston last season to total 912 yds and 6 TDs. Mike Shanahan's last two Denver teams posted 38 passes: 24 runs and then 32 passes: 26 runs per game, which is a higher pass to rush ratio then most people may think. These certainly appear to be good indicators for McNabb and his pass catchers. Chris Cooley "may see an expanded role in the offense" according to the Washington Post. 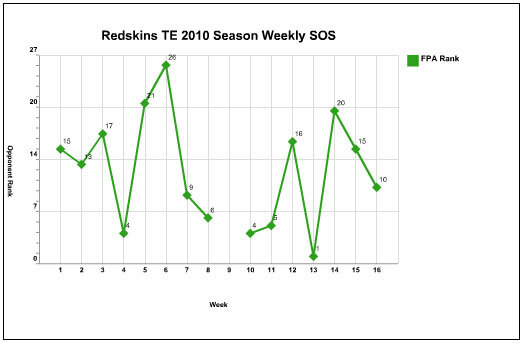 Cooley presents some risk, but Washington may have to rely heavily on him due to their thin WR situation. There is danger of a timeshare here since Fred Davis really took advantage of his opportunities when Cooley was out last year. Davis comes with a much cheaper 17th round price tag while Cooley is a 9th rounder. Cooley is much cheaper than your Clark (4th), Witten (5th), and Gates (4th) types so if you miss on one of those, feel good about taking Cooley as a low risk/high reward option. He has a stretch of 5 out of 6 games against bottom-end teams leading into your fantasy playoffs. Visanthe Shiancoe was one of the NFL's leading red zone target TEs in 2009 while Minnesota tied for 1st in the NFL in TE TDs (13), of which Shiancoe had 11. He also scored 7 of those TDs inside the 10 yard line. Minnesota had the 6th highest TE RZS% (30% of all Red Zone TDs went to TEs). No reason to think that will change with Brett Favre coming back for another year, however, if Favre somehow decides not to come back, remember that Shiancoe scored the third most TDs of all TEs in 2008 (7 TDs) even without Favre. He has slightly less value in a PPR league as he was only 12th in TE targets in 2009 but TD leagues value him even higher. The biggest value for Shiancoe in 2010 is his stellar fantasy playoff matchups. MIN has the #1 fantasy schedule of all TEs in the NFL. They play the Giants, Bears and Eagles and those three franchises have been some of the consistently worst defenses against opposing TEs for the past two years. Shiancoe can be had in the 10th round so it's safe to say you could get a potential top-10 TE well after you already locked down your starters in all other positions. That's a great value for a red zone beast like Shiancoe. If Owen Daniels had been able to finish the 2009 season, he was on pace for a career-best 89 catches for 1,136 yards and 11 TDs. That would have been good enough to outscore Dallas Clark. Instead, a week 8 ACL injury sent him to the sidelines. Fantasyomatic.com had a chance to speak with Owen Daniels this offseason and he said everything went "very smoothly" with his surgery. Houston grabbed another TE from Wisconsin, Garrett Graham, in the NFL draft as a little insurance in case Daniels cannot come back fully from his torn ACL. If he does, he will be in a rare group of players who were able to overcome such an injury. Plus, Daniels' fantasy success has a lot to do with his ability to get downfield so he will need strong wheels to be the O.D. of old. Daniels had a YPA of 10.0 in 2009 and a 13.0 Yards Per Catch and had the third highest Yards After the Catch of all TEs last year. The old O.D. is worth being excited about. You've gotta love a red zone TE, and although HOU threw to the TE in only 12% of their 63 Red Zone possessions, Daniels saw more red zone targets in 2009 than in his entire 16 game 2008 season. 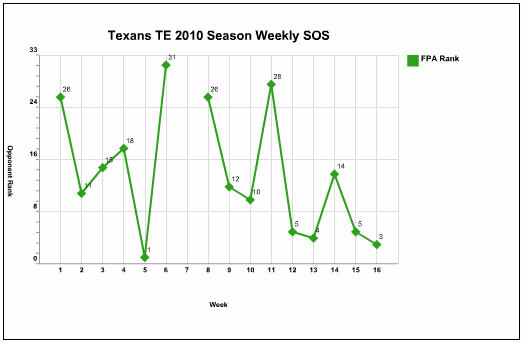 If he can come back healthy, he has a great season to look forward to in 2010, plus Houston has the 3rd easiest schedule for TEs in 2010. He has a late-season run with 7 out of 8 games against bottom-half defenses against TEs. Thanks to his ACL issues, he's going in the early 7th round of summer drafts, and if you can get him there, you should have strong TE1 value if Daniels stays healthy. Menurut berita yang dikutip oleh indo11, AC Milan mengawali musim 2012/2013 dengan cukup memprihatinkan. Ditinggal pemain senior dan bintang-bintangnya. seperti Zlatan Ibrahimovic, Thiago Silva, Alessandro Nesta dan Clarence Seedorf, Rossoneri sempat terpuruk mendekati zona degradasi setelah menelan beberapa hasil mengecewakan di pekan-pekan perdana kompetisi. Agen Bola www.indo11.com melaporkan bahwa Houston Rockets dikenakan denda sebesar USD 150.000 (Rp 1, 5 miliar) karena terlalu dini berkomentar tentang akuisisi Dwight Howard yang memutuskan hengkang dari Los Angeles Lakers. Federer Taklukan Florian Mayer , - Unggulan utama dari Swiss yang memainkan turnamen pertamanya sejak kekalahan mengejutkan di babak ketujuh Wimbledon lalu tersebut dengan susah payah menang 7-6 (7/4), 3-6, 7-5 pada perempatfinal. Roger Federer memerlukan waktu hampir dua jam untuk menaklukan petenis Jerman Florian Mayer dengan tiga set Sabtu dini hari tadi untuk mencapai semifinal turnamen tanah liat Hamburg. Berita olahraga melangsir Mayer yang berurutan 45 dunia dibandingkan Federer yang berperingkat lima dunia, melepaskan enam ace atau tiga kali lebih banyak dari bintang Swiss itu, namun Federer kuat dalam bertahan dengan memenangkan tiga dari lima break point di set ketiga. Federer pun mencatat rekor 32-4 di Hamburg, dan memenangi kejuaraan ini pada 2002, 2004-05 dan 2007, lalu runner-up pada 2008 di bawah Rafael Nadal. Berita yang dilangsir oleh agen judi terpercaya indo11.com Bintang Swiss tersebut akan menghadapi petenis Argentina Federico Delbonis pada semifinal yang berlangsung Sabtu ini. Unggulan kedua dari Jerman Tommy Haas tersisih setelah di perempatfinal menyerah dua set 6-2, 6-4 dari unggulan 12 dari Italia Fabio Fognini yang sukses memenagi turnamen ATP pertamanya di Stuttgart pekan lalu. Fognini akan menghadapi unggulan ketiga dari Spanyol Nicolas Almagro yang mengalahkan unggulan kelima Juan Monaco dari Argentina 4-6, 6-0, 6-3 di bawah waktu dua jam. Mesut Oezil mengonfirmasi bahwa pihaknya dan Real Madrid kini sedang menegosiasikan kontrak baru. Hal itu disambut gembira Oezil yang juga membuka peluang untuk mengakhiri karier di Madrid. Pemain berusia 24 tahun itu bergabung dengan 'El Real' dari Werder Bremen pada tahun 2010, setelah tampil mengesankan dalam gelaran Piala Dunia di musim panas tahun itu. Oezil, yang merupakan pemain internasional Jerman, lalu berhasil merebut hati para suporter Madrid berkat penampilannya di atas lapangan. Performa okenya itu pun membuat Madrid bersiap menambah kontraknya. Aku gembira mereka ingin memperpanjang kontrakku, tetapi belum ada yang disepakati. "Aku tidak tergesa-gesa tapi menyenangkan Real Madrid ingin terus mempertahankanku, karena itu artinya mereka percaya kepadaku," ujar Mesut Oezil. Menurut berita yang dilansir Indo11 Bola terkini Kontrak Oezil dengan Madrid saat ini sebenarnya baru habis tahun 2016, atau tiga tahun mendatang. Kontrak baru nanti kabarnya akan menambah durasi tiga tahun lagi, alias berakhir pada 2019. Pada akhirnya bukan tak mungkin pula Oezil bisa gantung sepatu di Madrid, sebuah wacana yang tidak ditampik oleh pemain bersangkutan. "Tentu saja aku bisa melihat diriku pensiun di Real Madrid, tetapi hal berbeda bisa saja terjadi. Dalam sepakbola perubahan bisa terjadi dalam semalam," tutur Oezil. Berita Football hari ini Marquinhos ternyata hanya satu musim berseragam AS Roma. Bek muda asal Brasil itu hengkang dari Olimpico pada musim panas ini. Pelabuhan baru yang dia tuju adalah klub kaya Prancis, Paris Saint-Germain. Marquinhos, yang kini berusia 19 tahun, dibeli Roma dari Corinthians pada musim panas tahun lalu. Pada musim perdananya di Seri A, dia langsung tampil impresif dan kabarnya membuat sejumlah klub top seperti Manchester United, Barcelona, dan PSG kepincut. Marquinhos sendiri telah memberi isyarat akan segera meninggalkan Roma. Lewat akun Twitter-nya, dia mengucapkan salam perpisahan. Saya tak akan pernah melupakan apa yang saya alami di Roma. Itu adalah kebahagiaan untuk saya dan saya akan selalu membawa kalian di hati saya. "Terima kasih untuk kalian semua, fans, klub, rekan-rekan setim saya. Daje Roma Daje," serunya. Seperti dilansir oleh Bola Sports terkini. Berita terbaru dan terkini Bola Soccer dari Agen Bola Indo11 – Playmaker Tottenham Hotspur Christian Eriksen mengaku senang karena dirinya menolak peluang bergabung ke Manchester City pada musim lalu. Eriksen merasa tidak akan bermain secara cukup di City, padahal ia ingin terus berkembang sebagai seorang pemain. Pemain asal Denmark itu bergabung ke Spurs dari Ajax dengan nilai transfer £11,5 juta pada bursa transfer musim panas ini. Ia merasa benar dengan keputusannya itu, dengan dibuktikan satu gol dan satu assist dari dua pertandingan awal di musim ini. "Perlu waktu untuk datang ke sini karena saya sempat mengatakan tidak beberapa kali," ujar Eriksen kepada wartawan. Agen Bola Indo11 Terpercaya - "Musim panas tahun lalu, City benar-benar menginginkan saya, tapi saya tidak merasa cocok." "Saya tidak merasa siap untuk liga seperti Liga Primer, dan sekarang tampaknya kepindahan itu adalah waktu yang tepat." Berita terbaru dan terkini Bola Soccer dari Agen Bola Indo11 – Pelatih FC Internazionale Walter Mazzarri berterima kasih kepada presiden Massimo Moratti yang berkenan berkunjung ke markas latihan tim jelang pertandingan kontra Sassuolo di Mapei Stadium, Minggu (22/9). Moratti sempat mengunjungi markas latihan Nerazzurri pada Sabtu (21/9), dan menggunakan kesempatan itu untuk berdiskusi dengan skuat. "Moratti datang untuk memotivasi tim dan apa yang ia katakan ada hubungannya dengan prestise klub," ujar Mazzarri. "Kami akan bisa melihat langkah riil dalam kualitas tim ini di pertandingan seperti lawan Sassuolo. Konsentrasi harus seratus persen." Agen Bola Indo11 Terupdate - Mazzarri kemudian menyatakan kalau Inter itu berbeda dengan Juventus. "Mungkin satu-satunya analogi yang bisa saya lihat, kedua tim finis saling berjauhan di papan klasemen dan ada yang tersingkir dari Eropa. Mereka adalah klub-klub kuat yang datang dari dua tahun dengan tempat yang relatif buruk. Tapi, saya tidak melihat adanya persamaan," ujar Mazzarri. Berita terbaru dan terkini Bola Soccer dari Agen Bola Indo11 – Lee Chong Wei sangat menyanyangkan keputusan mundur Rashid Sidek dari jajaran pelatih nasional bulu tangkis Malaysia. Tiga tahun lalu, pebulu tangkis nomor satu dunia itu juga sedih ditinggalkan salah satu idolanya, Misbun Sidek. Rashid Sidek memutuskan mengundurkan diri pada Kamis (19/9) karena ada masalah dengan Asosiasi Bulu tangkis Malaysia (BAM) di bawah kepemimpinan Tengku Tan Sri Mahaleel Tengku Ariff. "Saya sangat sedih dan kecewa dengan keputusan ini. Ini sangat mengejutkan. Dua pelatih favorit telah meninggalkan saya karena masalah manajemen," tutur Chong Wei. "Rashid adalah pelatih berdedikasi tinggi. Dia telah memberikan kontribusi besar untuk BAM dan Malaysia. Dia juga telah mengajarkan banyak hal kepada saya. Pemain lain seperti Daren Liew dan Chong Wei Feng juga merasakannya,"
Agen Bola Indo11 Terpercaya - Juara Jepang Terbuka 2013 itu mengeluhkan kerja BAM yang selalu membuat keputusan kontroversial yang membuat satu atau dua pelatih mundur setiap tahunnya. Pria berusia 31 tahun itu berharap BAM bisa memberikan alasan yang tepat terkait pengunduran diri Rashid. "BAM harus menunjuk pengganti yang tepat karena kami selalu mendapatkan masalah yang sama. Saya yakin ada sesuatu yang salah di sini, jadi BAM harus memperbaiki manajemennya," pungkasnya.